Tension headaches are a common condition that will affect most people at some point during their lives. They are usually mild and short-lived, but in some people, they can become more serious. Having a chronic tension headache could be a sign that you are under too much stress. This has been linked to an increased risk of diseases such as diabetes, heart attacks and strokes. Although a tension headache can often be relieved by over the counter medications, these can cause side effects and do not address the root cause of the problem. It is important to treat the reason for the headaches as well as the headache itself. Earthing is a natural way of relieving stress, improving sleep and reducing muscle tension and pain, all which create conditions for a headache. 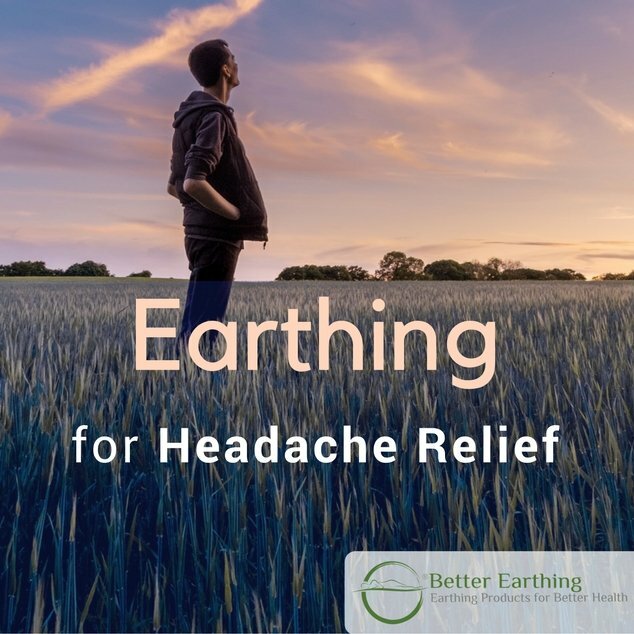 Perhaps this is why earthing may help reduce the intensity or frequency of a headache. Find out more below or see the list of researched earthing benefits. A tension headache normally affects the forehead and temples although it can also affect the back of the head. The pain is mild to moderate, dull and persistent. It is often described as a tight sensation or a band of pressure around the head. A tension headache may be accompanied by other symptoms such as muscle tension in the neck or shoulders or mild backache. The scalp and neck may also feel tender to touch. Tension headaches are not usually associated with sensitivity to light or sound, but in some severe cases, this is possible. Tension Headache or Migraine – What is the Difference? There are several major differences between tension headaches and migraines. The first is the type of headache. Tension headaches usually affect both sides of the head and are dull or tight in nature. Migraines usually affect one side of the head and are throbbing in nature. Migraines are also more severe, often leading the sufferer to have to lie down and wait for it to pass. Migraines are often accompanied by symptoms such as sensitivity to light and sound, dizziness, nausea or vomiting. Some people also experience visual disturbances before a migraine comes on. This is called the migraine “aura”. A tension headache does not have these additional symptoms and although they can be painful and annoying, they are far less severe than migraines. If you are suffering from regular headaches, it is important to check with your doctor to ensure nothing else is going on. Seek medical attention if you have a fever, stiff neck, confusion or neurological symptoms such as numbness or seizures alongside your headache. There are many reasons why people get tension headaches. The most well-known cause is stress. They often come on after a hectic day and will often resolve once you relax and unwind. They can also be brought on by poor posture, medication overuse, dehydration, eye strain or exposure to bright light. They can be triggered by muscle tension or lack of sleep including conditions such as obstructive sleep apnea. As suggested by this 2015 study, tension headaches may become chronic when repeated muscle tension begins to affect the central nervous system. This causes the body to become more sensitive to pain resulting in more frequent or more severe tension headaches. While occasional tension headaches are usually nothing to worry about, more frequent headaches could be a sign of chronic stress which can have a negative impact on your health. When your body’s “fight or flight” response to stress is activated too often or does not shut off properly, this can lead to raised levels of the hormones adrenaline and cortisol. This may cause symptoms such as anxiety, insomnia, fatigue and digestive issues as well as headaches. Because people with tension headaches are often also sleep deprived, this can contribute to pain sensitivity and create other health problems in time. Tension headaches have been linked to increased oxidant stress within the body. This is when the amount of harmful free radicals gets too high and cannot be controlled by antioxidants. This can lead to inflammation which has been linked to the development of cardiovascular disease and other serious conditions such as obesity and diabetes. One of the first things many people do when they have a headache is reach for the paracetamol. This over the counter drug is an effective painkiller and is generally well tolerated and safe. However, if it is taken long term, it can cause what are known as “rebound headaches”. These headaches occur when you stop taking painkillers after regular use. You think that it is just a normal headache, and take another dose. This starts a vicious cycle of headaches and medication overuse. Non-steroidal anti-inflammatory drugs (NSAIDs) are also commonly used to treat headaches. These include drugs such as aspirin, ibuprofen and naproxen. These work well to reduce inflammation and can help to relieve muscular tension as well as headaches. However, the do have some serious side effects including increased risk of gastric bleeding and ulcers, aggravation of asthma and allergies and increased risk of high blood pressure and liver damage. In some severe cases, tricyclic antidepressants such as amitriptyline may be prescribed. These can cause side effects such as drowsiness, dizziness or digestive problems. Taking these drugs at night can help to reduce daytime drowsiness and improve sleep. Luckily there are also plenty of ways to manage tension headaches naturally. One of the best things you can do is keep your stress levels under control. Try using techniques such as meditation, yoga or tai chi to help you relax and calm your mind. Physical therapies such as chiropractic, osteopathy, massage, and acupuncture can also be relaxing and help to release muscle tension as well as reducing stress. Massaging particular trigger points at the back of the neck or temples may also help. Try to pay attention to your posture, especially if you work at a desk or drive a lot. Keep your head raised with your shoulders back and your chin towards your chest. Strengthening and stretching exercises have been shown to help prevent tension headaches so it is important to keep active. Eye strain is another factor which can contribute to tension headaches. This can be avoided by reducing the amount of time you spend looking at a computer or smartphone and by having regular eye tests. Getting a good night’s sleep can also help. Stick to a regular bedtime, keep your bedroom cool and comfortable and avoid eating or drinking caffeinated drinks late at night. Dim the lights in the evening and do not look at electronic screens just before you want to go to sleep. Certain foods can also help to prevent tension headaches. Eat plenty of foods which are rich in natural antioxidants. These include fresh fruit and vegetables, especially leafy greens and dark coloured berries. Increasing your magnesium intake may also help. Foods with high levels of this essential mineral include nuts and seeds, whole grains, fish and seafood, beans, fermented soy products, leafy green vegetables, avocados and bananas. Staying hydrated is another important factor in avoiding tension headaches as shown by this study. Earthing, also known as grounding, is the practice of bringing the body into conductive contact with the earth. The earth’s surface is rich in free electrons, giving it a negative electrical charge. When this is transferred to the body, these free electrons act as antioxidants, neutralizing free radicals before they can cause serious harm. Earthing can be done simply by walking barefoot on a conductive surface such as damp grass or sand. You can also use an indoor earthing product (such as a mat, bedding product or band) which is connected to the earth via a lead and rod inserted into the ground, or through the earth port of a power outlet. This provides a safe and convenient way to relieve and prevent tension headaches without the risk of side effects. The 2011 research study Emotional Stress, Heart Rate Variability, Grounding, and Improved Autonomic Tone: Clinical Applications (Chevalier G. Sinatra S.) looked at the effects of earthing on heart rate variability, a measure of activity in the autonomic nervous system. 27 subjects were seated in reclining chairs for two hours with conductive patches attached to their hands and feet. During this time they spent 40 minutes ungrounded, followed by 40 minutes grounded, then a further 40 minutes ungrounded. Measurements were taken during the ungrounded and grounded periods and compared for analysis. The study found that heart rate variability was improved during the grounded period. This is indicative of improved balance between the sympathetic and parasympathetic branches of the autonomic nervous system, a sign of reduced emotional stress. A 2004 study published in the Journal of Alternative and Complementary Medicine looked at the effects of earthing on cortisol levels, sleep, pain and stress. The subjects were suffering from sleep disturbance, stress, and pain, including one who had temporomandibular joint pain and headaches. They had their cortisol profiles measured before the study and after sleeping grounded to earth for six weeks. The study found that after six weeks of earthing, the subjects’ cortisol levels had normalized and they reported improved sleep, reduced emotional stress and pain. Earthing has also been shown to relieve muscle tension, soreness and inflammation. This 2000 study found that earthing overnight not only improved sleep but also relaxed the muscles and helped with a wide range of other conditions. It took 60 participants all suffering from poor sleep and chronic muscle or joint pain. All of the subjects slept on carbon fibre mattress pads, with half grounded and the other half ungrounded as a control. “The benefits of grounding the body were expected to relax muscles and improve sleep. This also proved to be true. A further 2010 study found that earthing improved the recovery time from delayed onset muscle soreness (DOMS), reduced inflammatory markers and relieved pain. The subjects were exposed to excessive exercise to induce DOMS. Half of the subjects were earthed using conductive pads and sheets while the other half were sham earthed. The earthed subjects reported faster recovery and reduced pain. Levels of 30 out of 48 inflammatory markers differed significantly between groups. The easiest way to experience earthing is by stepping outside and walking barefoot on the ground. Within a few seconds you can feel your muscles begin to relax and your nervous system being calmed. To benefit from earthing on a daily basis, consider investing in an indoor earthing system. This will allow you to enjoy all of the advantages of earthing in the comfort of your own home as you work, relax or sleep. Brown D, Chevalier G, Hill M. ‘Pilot study on the effect of grounding on delayed-onset muscle soreness.’ Journal of Alternative Complementary Medicine. 2010 Mar; 16(3): 256-73. Chevalier G, Sinatra S. ‘Emotional stress, heart rate variability, grounding, and improved autonomic tone: clinical applications’ Journal of Alternative and Complementary Medicine 2011;10(3). Ghaly M, Teplitz D. ‘The biologic effects of grounding the human body during sleep as measured by cortisol levels and subjective reporting of sleep, pain, and stress’ Journal of Alternative and Complementary Medicine 2004;10 (5): 767–776.